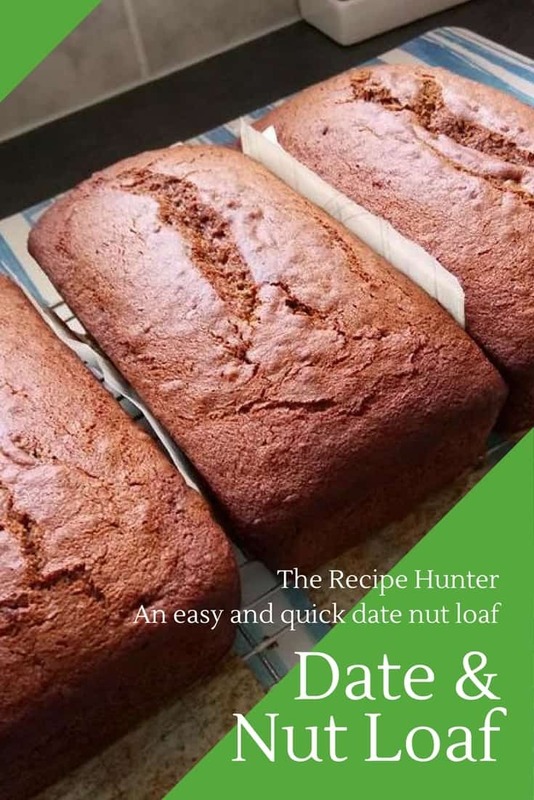 An easy and quick date nut loaf, so delicious and yummy! Sprinkle with bicarbonate of soda. Pour the boiling water over the dates. Leave for a while to cool and soften. Preheat the oven to 180deg Celcius. Grease a loaf pan with a volume of 1.5 liters. (please check size of your pan). Line with wax, parchment, brown paper. Stir in the vanilla and date mixture. Sift together the cake flour, baking powder, and salt. Stir this into the date mixture. Bake for about 1&1/4 hours until done – test with a skewer, ready when it returns clean. Turn out onto a cooler, remove the paper and leave to cool. After establishing the volume of my pans, I found they held only 1 liter each. I, therefore, doubled up on the recipe and baked 3 loaves at the same time as I have a fan-forced oven. Now I am able to give one to my young neighbors, freeze one, leaving Beloved and I the enjoyment of the third loaf. This recipe is one I have often used. It comes from one of my favorite books “Annette Human ALL-COLOUR COOKBOOK”. It was launched in 1994 and I bought my copy from a door-to-door salesman who fortunately for me, found me behind my desk when he popped in. I remember buying the book, more for his sake than mine; it was a hot day and he appeared to be battling to sell his load. His face, when I said I’d buy one, lit up like a chandelier and he bounced out into the hard world, encouraged.